We’ve been busy over the last few weeks undergoing testing of the FitMachine for the FCC and CE certification process. For those not familiar with these certifications the FCC, or Federal Communications Commission, is an independent government agency in the United States which regulates wireless communications in the country, as well as other forms of communication. CE is similar but for Europe, with the difference that it’s not an organisation, but a set of standards which your product must adhere to if you want to sell it in the EU. 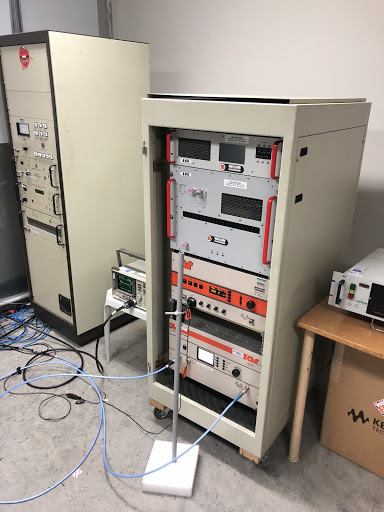 Being based in Brisbane, Australia we chose to do our testing at EMC Technologies’ Sydney test lab over a period of two weeks. 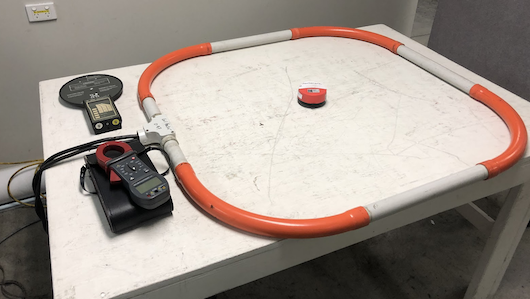 In addition to the tests mandated by the FCC and CE standards, we chose to do a number of extra tests to determine if the FitMachine was susceptible to extreme electrical and magnetic fields. This was decided after seeing such environments previously at several customer installs such as aluminium smelters, and in close proximity to mobile phone towers. In all cases, the FitMachine was found to surpass the requirements. 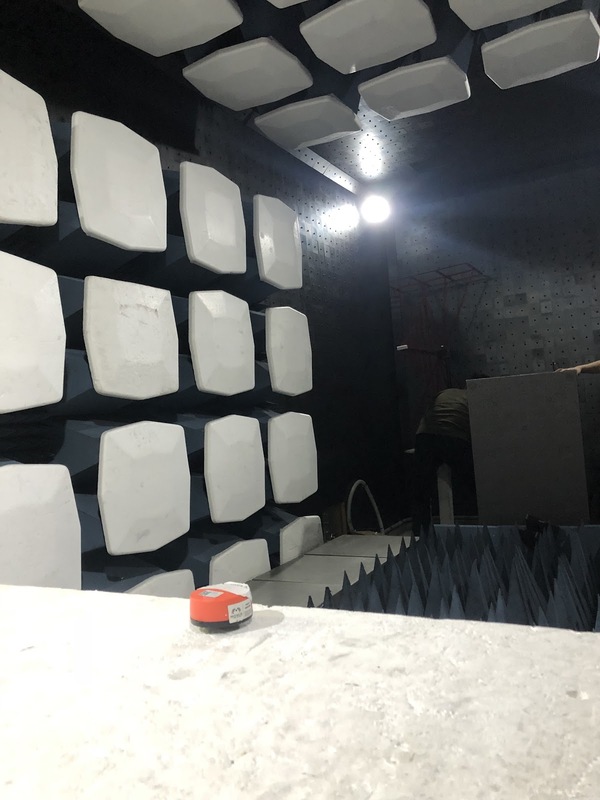 The tests were all performed in a Faraday Cage / Anechoic chamber. Basically, it is a room which blocks out any radio waves from the outside as well as stopping any internal reflections. It’s important to block these external sources of interference to make sure that any signals measured are coming from the FitMachine itself and not from other devices in the area. The FitMachine was put on a grounded metal table and all surfaces of the device were zapped with 6,000 volts through a device – which looks like a fancy cattle prod – to ensure these high voltages could not make their way into the internal electronics. 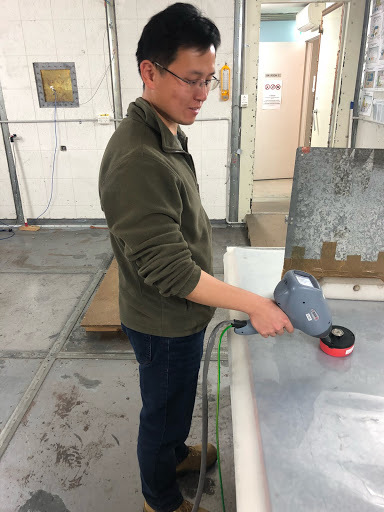 This test is meant to check that static discharges – like those generated by people walking on carpet, as well as larger, more industrial sources – cannot damage the FitMachine. These tests are designed to check that our Bluetooth and WiFi radio transmitters are operating correctly and at the right frequency. They are particularly important because the FitMachine shares the WiFi and Bluetooth radio spectrum with all sorts of other devices. Ensuring that the Fitmachine does not “leak” signals onto other parts of the spectrum ensures that it will not interfere with other devices operating in the area. When doing these tests, we found that the FitMachine operated well within the allowed range of spurious emissions on other radio frequencies. Under some circumstances even circuits which are not designed to transmit radio waves can do so, thereby creating noise on the radio spectrum which can interfere with other devices or degrade their performance. This is relatively common in high frequency portions of circuits like those used to communicate with digital sensors or clock signals for micro controllers etc. We found that the FitMachine did not create any radiated emissions in any circumstances, which made our engineers very happy. This series of tests is designed to make sure that exceptionally high magnetic, electric and electromagnetic fields will not interfere with or damage the FitMachine. These series of tests covered from very low frequencies (50Hz) to high frequency (above 1.5GHz). They were not part of the FCC/CE certification, however, we wanted to do them ensure that the FitMachine can handle industrial operating environments. The tests only mandate that once the source of the interference is removed, that the device resumes its normal operation. We well and truly surpassed this – the FitMachine continued to operate – even with any source of interference that this large bank of equipment and the test engineers could throw at our sensor. The outstanding performance in resisting industrial sources of interference is due to the high performance of WiFI and Bluetooth in these industrial environments. You might be most familiar with WiFi in the home and office environment, but in fact WiFi is less susceptible to interference than many of the more “industrial” protocols such as Zigbee or LoRa/Sigfox. This is due to the fact that in many densely populated environments there is more RF noise than in industrial environments. The WiFi standard has evolved in these environments and uses many techniques to mitigate their effects. One key element is the use of “Frequency Hopping”. This involves jumping between many different channels so that if any one is blocked, the overall speed will be reduced but the signal will still get through. Our team is thrilled with the results from the certifications testing and the first certified FitMachine sensors have already been shipped. If you would like to find out more about our FitMachine solution, please request a demo.